The term "Waist Steering" is very new to the world of skiing. It was less than 2 years ago that a couple guys from Utah stumbled on this valuable means of causing a ski to turn, and then created an instructional DVD to help people learn to employ it in their own skiing. Since then, word of WAIST STEERING has spread rapidly through the skiing ranks, both in America and countries abroad. Unfortunately, as with any sudden spread of news through numerous channels, some misinformation and confusion can occur. This article is intended to clear up any confusion and misconceptions, and provide a clear picture of what WAIST STEERING is and how it can be used in your day to day skiing. But first, let me tell you a little more about the history of WAIST STEERING. It's an interesting story. 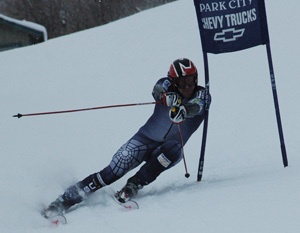 Two seasons ago in Park City, Utah local ski racer Tommy Kirchhoff happened to share a lift ride up the mountain with Masters Racer, USSA Race Coach and ModernSkiRacing.com founder Gary Dranow. As they rode, Tommy excitedly began to share with Gary what he thought was a technical breakthrough he had stumbled upon. Tommy, who is also a highly skilled Tai Chi practitioner and instructor, explained how vital employment of the core muscles is in Tai Chi, and how he had just recently set out to bring the core muscle skills he'd developed through his involvement in Tai Chi into his skiing. Tommy told Gary that the results of that effort were far beyond his expectations, and he expressed a desire to show him. As Gary listened he was very dubious, but he politely agreed to take a run with him. Tommy gave Gary a brief description of how he was incorporating his core into his skiing, then provided a demo. The description was good, and when Gary gave it a try he was stunned at what he felt. Suddenly he had a sensation of his skis being powered through his turns such as he'd never experienced. Immediately Gary knew Tommy was onto something, so he spent the next couple weeks refining his understanding of it, and then developing a teaching progression so it could be shared with the rest of the ski world. The result of that effort was the "WAIST STEERING" instructional DVD that Tommy and Gary collaborated to produce, which is now available for sale here at ModernSkiRacing.com. So how did I get involved with all this? Well, in the summer of 2005, a mere few months after the fateful meeting of Tommy and Gary, someone started a thread on Epicski about this new thing called WAIST STEERING. Epicski is one of the worlds largest ski forums, and a site at which I'd been a contributor in their instruction forum for a couple years. As a race coach with extensive experience, and a devote student in the extreme technical end of the sport, I was immediately interested in exploring this new concept. During the course of what proved to be the longest thread in Epicski instructional forum history, I became very intrigued with the concept of WAIST STEERING and accepted Gary's invitation to join the team at MODERN SKI RACING. Since that day I signed on with MSR much evolution in our understanding of this new technical concept called WAIST STEERING has taken place. Tommy has moved on to pursue new opportunities, and Gary and I have continued on in the quest to come to understand to a deeper level how the core muscles can be employed to the advantage of the general skiing public. That exploration has unlocked some valuable new information that I will share in the "PRINCIPLES" section of this article. The importance of the stomach muscles in skiing is not a new concept. The racing community and professional instructors have understood for decades how crucial the muscles of our core are to maintaining balance. What WAIST STEERING brings new to the table is a clearer understanding of the specific benefits that can be derived through exploitation of the rotational aspects of core muscle recruitment. Let me explain this a little better. The muscles in the area of our waist have the ability to produce multiple forms of movement. We can use them to tip our upper body forward. We can tip back. We can also tip laterally to each side. But the specific form of core muscle recruitment that WAIST STEERING focuses on is that which can be used to rotate the pelvis clockwise and counterclockwise. It's this rotational use of our core muscles that is at the foundation of WAIST STEERING. I've personally found it an interesting journey exploring over the past year all the ways in which we use our core in this manner while skiing. While Tommy and Gary initially only zeroed in on a single application of core recruitment, what we've later come to realize is that the manner in which we can use WAIST STEERING while skiing is multifold. In this article I will explain in detail each of these applications, and how they can be employed by any skier. Gary's and Tommy's original focus with WAIST STEERING was on how it could be used to create a quality carved turn that could be easily taught to skiers new to carving. In this technique students are taught how to use the rotational power of their core muscles to simultaneously tip both skis up on edge, then power the outside ski through the arc that tipping produced. Here's how it's done. We first show students how to assume an athletic stance, with structural alignment achieved through the stacking of the hips, shoulders and head directly above the feet. 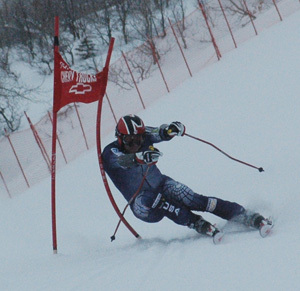 We call this the MSR (Modern Ski Racing) stance. We then help them learn to isolate the recruitment of their core muscles by stabilizing the position of their shoulders and having them rotate they pelvis via contraction of their stomach muscles. Immediately they feel how this core rotation tends to roll their skis on edge, and that the more force they put into that core rotation the higher up on edge the skis seem to roll. Gary coined the term "screwing down" for this principle. At the same time students are taught to roll the skis on edge with their core, they are also instructed how to ensure the skis roll up onto edge together by means of a technique Gary describes as "skiing cowboy". 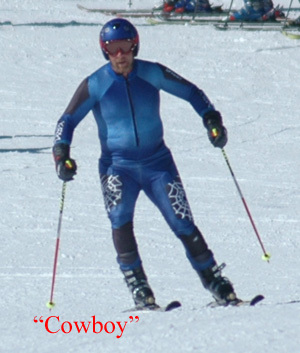 Skiing cowboy is simply striving to keep separation in the knees as the skis tip up onto edge. This encourages both skis to tip up on edge simultaneously and equally when core rotation is employed. Something else interesting happens when the core is used in this manner to roll the skis on edge. Some of that rotational force being created by the core seeks to rotate the skis about the boots too. Simply stated, it causes the tips of the skis to attempt to move right and the tails to move left, or vise-versa. That rotation force applied to the ski does not result in a steered turn because the level of the force is low, and the rotational effect is not about the plane of the snow, it’s about the plane of the edge angle. In other words, if the skis are tipped up on a 45 degree angle, the rotary force being applied to them attempts to drive the tips of the skis into the snow at a 45 degree angle. The result is extra pressure being applied to the snow by tips which serves to hyper engage them and sharpen the turn. Students immediately feel this effect. Finally, the concept of using WAIST STEERING to power the outside ski through the turn is introduced. When carving a turn the outside ski is traveling a longer path than the inside ski, simply because it is further away from the turns center. Geometry 101. This longer travel track requires to the outside ski to travel faster than the inside ski to keep up. By using the power of the core to advance the outside hip forward the negative effects of that speed differential can be overcome. By advancing the outside half (outside foot, outside hip, outside shoulder) through the use of core power, the tendency for the outside half to fall behind and the student to become over countered is completely eliminated. The outside half of the body and the outside ski seem to come to life, and the sensation contrast is striking. Suddenly the feeling of bracing against a heavy and dragging outside ski is gone, and it's replaced with a feeling of lightness and acceleration. The outside ski feels as though it's literally rocketing forward through the turn. This is the most prominent sensation students experience when the first try WAIST STEERING. The typical response is "WOW"! But as effective as WAIST STEERING is for introducing people to a high quality carved turn, and while it provides some unique advantages to traditional approaches, it does in this form carry some limitations. 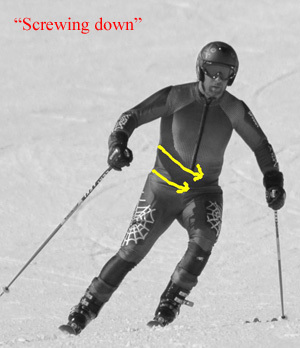 Because this application of WAIST STEERING is with done with the pelvis very rotationally square to the skis (hips pointing the same direction of the skis), the ability to manage ones balance through angulation can be compromised, and banking/leaning is very prevalent. This is fine for low to moderate edge angle turns, but there comes an edge angle threshold at which such inclinated positions just won't allow balance to be efficiently maintained on the outside ski. When higher edge angles are desired, a degree of counter (hips faced toward the outside of the turn) is required to allow angulation to keep us balanced on our outside ski. And even in low edge angle turns a tad bit of counter serves the skier well by causing the outside foot to pronate, which helps direct pressure toward the edge the skier is tipped up on, enhancing balance and causing that edge to positively engage the snow. This is why we subsequently began to take a little deeper look at WAIST STEERING. Is it a technique that only has application from a rotationally square stance, we asked ourselves, or could it also be incorporated into a stance that contains counter? Through that exploration we've come to clearly realize how pervasively we use our core muscles in a rotational sense in all facets of skiing, and why it's even more important to focus and develop these WAIST STEERING skills then we initially realized. Skiing is a dynamic sport. The environment in which we perform is ever changing, and as such we are constantly called upon to manage the rotational orientation of our pelvis to meet the current needs. We do this through the continuous recruitment of our core muscles. I'll explain. During a turn a necessary amount of counter is called for. That amount is dependant on the forces each particular turn creates and how high an edge angle we intend to achieve. There are a couple ways we can achieve that countered position. One is to just let it happen naturally. We call this "skiing into counter". 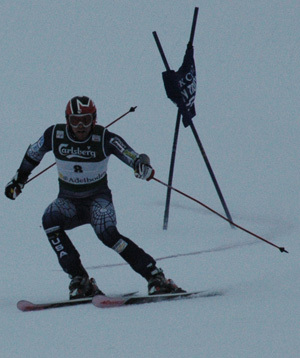 As the skis change direction through the turn the pelvis is not forced to rotate in harmony, and counter just happens. At other times, a particular situation will demand the creation of counter be sped up, and the core muscle recruitment associated with WAIST STEERING will be required. In either instance, there comes a point when all the counter needed for a particular turn will have been created, and for the remainder of the turn the core powered advancement of the outside foot/hip/shoulder can be used to provide all the benefits of powering the outside half through the turn as described above. And there's yet a couple more instances in which we need to employ WAIST STEERING while skiing. The counter a skier creates while turning needs to be eliminated at the end of that turn, during the period called the transition. A transition is the period during which one turn is brought to an end and a new turn is initiated. It's during this transitional period that a skier uses the power of the core to eliminate the counter of the prior turn, returns to rotational neutral (body faces the direction of the skis), and then continues to use the core to establish the initial counter needed to pronate the new outside foot for the start of the new turn. Core muscle involvement during transitions is hugely important. So, yes, WAIST STEERING has significant application in high end carving too. It's with this understanding that Gary and I are now in the process of producing an advanced carving DVD that will explain in detail all the unique principles of high level carving, and how the core involvement of WAIST STEERING melds into those principles. Release date is projected to be spring of 2007. Finally, we've also explored the value and usage of core involvement at the opposite end of the skill development spectrum. We believe that WAIST STEERING can offer an attractive alternative to more traditional methods of steering the skis during wedge turns or beginner and intermediate level parallel skiing. Steering is the act of causing our skis to change direction as a result of muscular effort. In essence, we twist our skis into a new direction of travel. Steering is best accomplished when the skis are on lower edge angles because they're less able to firmly engage the snow and restrict a skier’s ability to twist them about the surface of the snow. WAIST STEERING can very effectively execute steered turns by using the significant rotational power that can be generated by the muscles of the core. The way it's done is to create rotational resistance in the legs and ankles so that the torque we generate in our core is relayed directly down to our feet. That force then twists the feet, which thereby turns the skis. The beauty of the technique is that not only does it employ the strong muscles of our core to make the twisting of the skis seem fairly effortless, it also keeps a skier rotationally aligned. Yes, I know, the term rotationally aligned could use a little more explanation. Rotational alignment is the state of having all parts of the body pointing in the same direction. If the knees and pelvis are pointing in the same direction as the skis, so too should the shoulders and torso. It's through rotational alignment that we're afforded the strongest body position for resisting the massive forces we can be subjected to while skiing. It also provides the best stance for maintaining balance. Steering by means of WAIST STEERING is a very effective way to ensure rotational alignment persists while turning because the rotational tension maintained in the legs keep them in perfect rotational alignment with the core, and the core in turn pulls the torso along to keep it in rotational harmony too. The entire body rotates unison with the steering of the skis. In fact, the technique is so efficient, and the force generating movements so internal, the casual observer usually won't have a clue where the power is coming from to turn the skis. Additionally, how sharply the skier steers her skis can be easily altered by simply adjusting how much rotational force she chooses to create with her core. Turn shape is easily controlled in this manner, and it can be quickly and precisely altered at any moment. It's really a very slick technique. So there you have it; the principles of WAIST STEERING. Please understand that WAIST STEERING does not represent an Island that exists in isolation from all other conventional skills associated with high level skiing. More accurately, becoming aware of the importance our core and learning how to put it to work for us on many fronts while we ski adds a significant brick in the road to becoming an expert skier. No matter what the objective, be it carved turns or steered, highly countered or totally square, or transitions of any kind, proper utilization of the core will enhance a skiers ability to meet their objectives with power, efficiency and grace.